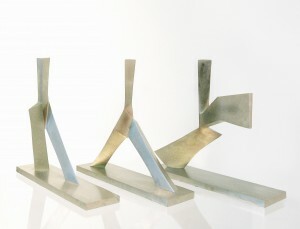 In 1986 Oskar Höfinger designed the three-part sculpture group „Step – Walk – Leap“ for the rehabilitation center „Weißer Hof“ in Klosterneuburg near Vienna. Unlike his two other designs, the monumental marble statues „Gestürzter“ („Fallen“) and „Erhebung“ („Rising“), the ensemble was not erected at Weißer Hof. In 1988 „Step – Walk – Leap“ was executed in chromium-nickel steel and was shown in the historic city of Graz as part of the Styrian provincial exhibition in 1991. The illustrated version is made out of nickel-plated bronze. Each of its three figures is 13 inch high and can be positioned freely. The great vitality and energy of the artist Oskar Höfinger can be felt through this sculptural ensemble. It is a symbol for a new beginning and the joy that a personal progress can bring.